Bare root fruits, berries and nuts usually begin appearing in Sonoma County nurseries around the first of the year. At this stage, the plants resemble nothing more than leafless sticks that have been ever so rudely ripped from the soil. The only thing that looks halfway promising is the descriptive tag which has a colored photograph of delicious, juicy-looking fruits. Professional orchardists must use these sticks all the time, but what about Joe the Gardener? Getting from stick to apple looks very difficult, if not impossible. Kip and Betty Miller came to Sonoma County from Southern California twenty years ago. Together, they built their home on a ridge overlooking the Alexander Valley. Being avid gardeners (Betty is herself a Master Gardener), they soon established a large vegetable garden and orchard. The orchard’s location, elevation 800 feet, required that they pay special attention to their microclimate’s temperature ranges, water and soil conditions, and varmints. MG: So what did you do first? After you decided to put in the orchard, of course. Millers: Our grown children were the impetus for all this, as they gave us money for sixteen trees as our Christmas present in December 1991. That’s how we named it the Miller “Family” Orchard. We had to clear out existing trees and bring in a backhoe and tractor to level the terrain and create a slightly north-facing slope. The northern exposure was to get the best chilling temperatures for the fruit trees. Fruit trees need a certain number of chill hours (hours less than 45 degrees F.) each season before breaking dormancy and to perform at their best. After we cleared the 1000 square foot space, we fenced both the orchard and veggie garden, using six foot high deer fencing, on top of which we added an additional foot of vineyard wire for good measure. ¾” chicken wire was added in the veggie part, as the deer were reaching through to nibble the sugar snaps. MG: Did you use any other forms of physical barriers? What about gophers? Millers: One morning we lost our entire crop of Santa Rosa plums in two hours to a flock of crows. They were watching those plums just as we were. The crows or squirrels also took all of the unripened fruit that year, with the exception of the peaches. We considered netting the trees, but at a cost of $40/tree, we decided it was too costly and too much trouble. We do have the blueberries fenced like an aviary, and we have tried the sparkly ribbon and garlic trimmings on top of the dwarf trees, but it has not seemed to help. We have a built-in deterrent to gophers…our soil is too rocky. The fencing seems to keep out the foxes, possums and raccoons most of the time; however, we did have a fox this year. And the wild turkeys ignore the orchard in favor of the vegetables. I am not going to say anything about turkey management here. MG: After all this hard work, were you then ready to plant? Millers: We did our homework with the tree selection and purchased sixteen trees all at once, bare root ones in January 1992 from Harmony Farms. They were about $20 apiece. We selected dwarf and semi-dwarf varieties for the simple reasons that the trees bear fruit sooner; we could plant more varieties in our space; and they were easier to care for regarding thinning, pruning and harvesting. We can use an 8’ orchard ladder for all of them. As far as early maturing goes, the dwarf peach tree, “Golden Glory” bore fruit its second year. MG: What other factors did you consider in your choices? MG: So what happened after you brought your bare root trees home from the nursery? Millers: We had all the holes (24” x 24”) ready to go and had filled them with water the night before. Being on top of a ridge, we have basically no water table and the soil is gravelly, decomposed Franciscan rock over a base of Gray Wacky bedrock (which explains why even our many native trees are not very large). We spaced the trees eight to fifteen feet apart depending on whether they were dwarf or semi-dwarf; now we feel that they are somewhat crowded. The apple trees were sited where they would get the best chill factor. We filled the holes with a 50/50 mix of native soil and planting mix with a handful of peat moss thrown in for good measure. We planted five apple trees, three pears, a hachiya persimmon, two figs, a self-pollinating cherry (that turned out not to be self-pollinating), a Santa Rosa plum, five peach trees and an apricot which never bore fruit and was replaced by a multi-grafted plum. We don’t recommend apricots; we find them difficult and problematical. MG: How do you handle pollination? Millers: Each tree has a companion pollinator. The cherry tree turned out not to be self-pollinating. The only other problem was the plum trees bloom so early, often before the bees find them. We planted a rosemary plant between the two plums to attract the bees and now get bumper crops…or maybe it is because we haven’t had the late rains these last two years and the bees are out to work earlier. MG: You mentioned that you have no water table. How do you handle irrigation? Millers: The trees need water. If you want good-sized fruit, you need to water. Because we are on a ridge, we basically have no water table and what native soil we have is gravel and rock. We rely on a drip system, with ten emitters per tree and water forty minutes on a regular basis, every other day. We begin watering about a month after the rains stop. MG: What kind of maintenance does the orchard take? Is it a lot of work? Millers: The orchard does take work. The harvest is spread over several months. Most of the work is pruning which takes about sixteen man hours and then another ¾ day for spraying. The season dictates the chores. Right now is the time for spraying and pruning. You need a compressor-filled sprayer tank for that; pruning takes loppers, a curved saw and pruning shears. Back to the spraying, though. Did we say that we are organic gardeners? We use dormant oil with sulfur and that is it. But you have to spray. Optimally we spray three times: the first, just after pruning and the last just before bud break. The best time is when we have four or five days of dry weather in a row. Also, winter time is when you want to clean up the downed fruit and debris. This prevents over wintering of insect eggs and other larvae. We have found that if we take the weeds down the soil, we are able to reduce the amount of dimpling in the pears caused by the Lygus bug. We fertilizer after the bud break, following the needs of each tree, using formulas we found in Rodale’s Organic Gardening Book years ago, but more recently we simply use a 16-16-16 mix. After June drop, when set fruit naturally falls from the tree, it is necessary to thin the remaining fruit. We know that we should do it sooner, but we don’t. 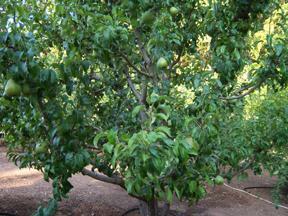 The fruit should be thinned to about six inches apart on the branch. By doing this, the tree produces bigger and tastier fruit. It also reduces the weight load on the branches, so that they don’t split or crack. We try to build supports for the branches, but sometimes the wind blows out the supports and we lose branches. MG: So how do you know when your fruit is ready to pick? Watch for crows? Millers: With the apples, we check the color of the seeds, which should be black. The plums are judged by the feel, and they will continue to ripen after they are picked. The figs need to be soft and the persimmons change color and become a little soft. They will also continue to ripen after harvest. The peaches should remain on the tree as long as possible to develop a full flavor; then you cup one in your hand and lift with a slight twist…the stem should separate cleanly. The pears should also be cupped in your hand and lifted. If the stem separates, the pear is ready to harvest, but is not yet ripe. If left on the tree to ripen, the texture will be ruined. Store the pears in a cool (40-53 degrees F.) location until ripe but still firm. MG: Kip and Betty, thank you ever so much.